Kansai TV, Japan has a programme called “Rainbow Colour Jean,” a live entertainment & information programme including traveling & life-style sections. The production crew stayed with us while in Christchurch. We tagged along to watch the shooting. 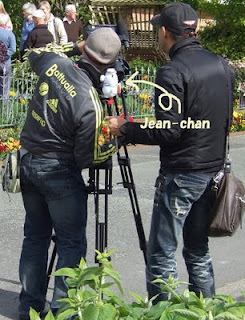 You can see Jean-chan next to the cameraman in the photo. Have a close look and you can see that Jean-chan has the marks of being a very busy world traveller. The crew were flat out from the time they arrived till the time they left and so we should be able to see Christchurch being introduced in a good light! Its going to be broadcast in November on Kansai TV. Every time we go to AMI Stadium for a Crusaders / Canterbury game (rugby) we can see how the new Deans Stand is coming along. It’s being built for the 2011 Rugby World Cup, now less than 2 years away. The Deans Stand is named after the Deans Family, one of the oldest families in Canterbury, which has contributed players and coaches to Canterbury and the All Blacks. Robbie Deans is currently coaching the Wallabies (Australian national team) because the NZ Rugby Union kept the current All Blacks coach even though we lost the world cup (but that’s another story!). Put this date in your diaries, Saturday 7 August 2010. The first international at the new AMI Stadium. All Blacks v Australia. We’ll be there. We took this photo last Friday when Canterbury played Manawatu. It was a great game with Richie, Dan, Brad Thorn, Keiren Read all playing. We 50-26!!! To keep the Ranfurly Shield in the South Island till next year. At the Rugby World Cup, AMI Stadium will be hosting 5 pool matches and 2 Quarter Finals.